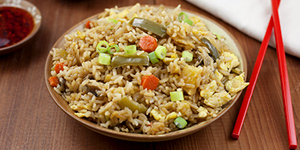 The main event for Thanksgiving is always the meal. Make yours extra special with these DIY place card holders that are sure to wow your guests. 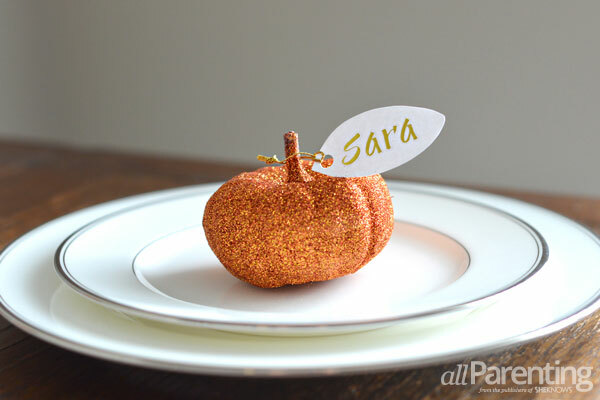 Coat the mini pumpkin with spray adhesive, then sprinkle the glitter over the pumpkin until it is completely covered. Let the spray adhesive set for 1 to 2 hours, then shake off any excess glitter. Cut out a leaf shape from a piece of card stock. Use a hole punch to punch a hole in one end of the leaf. Use alphabet stickers to spell out your guest's name on the card stock leaf. Cut a piece of gold thread and tie it around the hole in the leaf. Tie a second knot about 1 inch from the leaf and cut off any excess thread. Slide the loop over the stem of the pumpkin, and then your place card holder is ready to use! Gather 7 cinnamon sticks into a bundle. Put a small dab of hot glue on the underside of the bundle, and then press the end of the raffia into the glue. Wrap the raffia around the end of the bundle 3 to 4 times, cut off the excess raffia and glue the end into place. Repeat steps 2 and 3 for the other end of the bundle. Cut a piece of scrapbook paper that is small enough to fit between the 2 pieces of raffia. 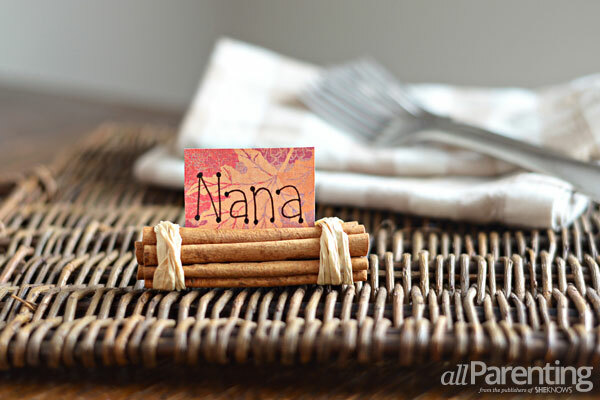 Write the name of your guest on the scrapbook paper, and then slide the piece of paper between the cinnamon sticks. Glue the end of the wire to the bottom of the pine cone. 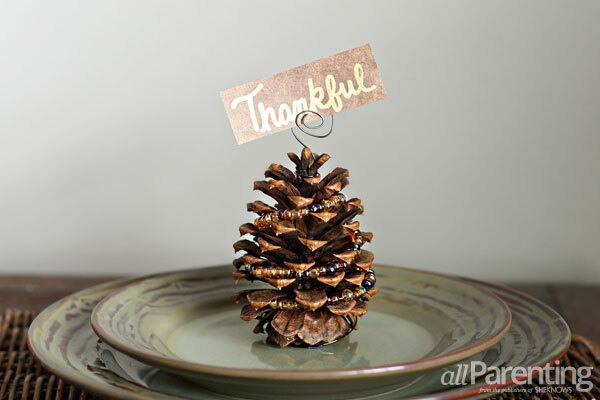 Once the glue is completely dry, wrap the wire once around the bottom of the pine cone. Thread the beads on the wire, and then wrap the beaded wire around the pine cone until you reach the top. If any extra beads remain on the wire, slide them off. Wrap the wire around the top of the pine cone once, then cut the wire, leaving an extra 4 inches. Curl the extra wire into a spiral at the top of the pine cone. Cut a piece of paper and use a paint pen to write your guest's name or an inspirational message. Slide the paper into the wire spiral.